Also on top of this versatility of use the kettlebell is also one of the few serious training tools that you can realistically keep in your own home. 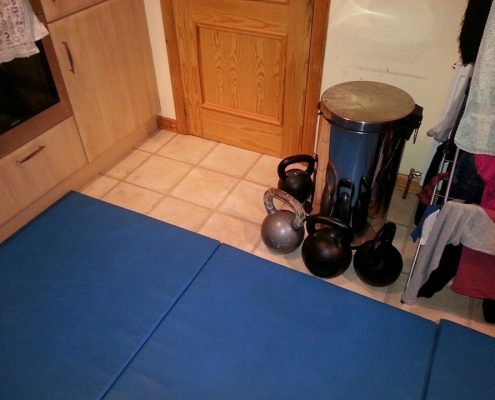 When left unattended in the kitchen, kettlebells gather around bins hoping for scraps of protein (yes, I put some mats in my kitchen…). 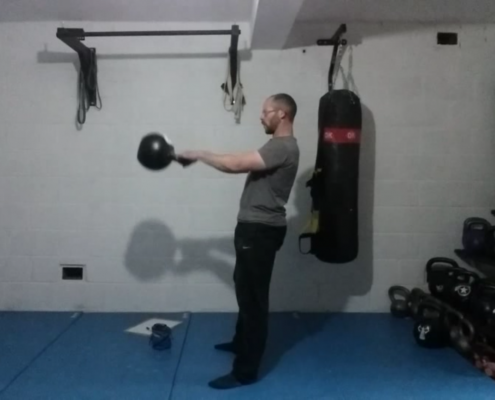 Without going into each too much detail, for the serious trainee there’s a good chance your original ‘heavy kettlebell’ will slowly turn into your higher rep kettlebell and maybe even turn into your mobility training kettlebell. With that in mind we’ll talk about how to choose the weight for your first kettlebell, or preferably, three. Normally, when I have new students turn up to my class they are used to the more aerobic and choreographed schools of thought. All I will say to these are if they are working for you in terms of your physical goals (appearance, fat loss, physical abilities) then carry on! But if they aren’t helping you change the shape of your body, increase your strength or shrink your waist size, you might want to consider why you really keep going back. Alternatively we have people who have been to kettlebell classes that are basically circuit classes with a kettlebell. Now you can and do get quality kettlebell circuit classes but many of these are based on ‘As Many Reps As Possible’ (AMRAP) in a given time. This leads to poor quality movement at best, and injury at worst. The biggest downsides of these styles of class is that the fast pace is not conducive to learning good, safe, technique. Also the fast pace means that you are generally limited to one size of kettlebell. The weight of this ‘bell will be limited by the most difficult exercise in the sequence and also by the fact that the class needs to remain safe. The biggest thing that will help change your body are safely executed strength and power training. Now don’t go thinking that I’m planning on turning all of you into Eddie Hall, if the thought of strength training fills you with any type of anxiety then please read what I actually mean by strength training. So in a sweeping moment of generalisation, based on almost a decade of teaching group kettlebell training here is my advice for the beginner who wants to buy some kettlebells for home use. Going back to when I started teaching, these were the standard beginner packages commonly sold. This ties up quite nicely with my observations, but I have noticed a few problems with these configurations over the years. Ladies, the jumps from 8kg to 12kg and 12kg to 16kg are 33% and 25% respectively. This isn’t a major problem for things like swings, squats and even get ups if they are well trained and cleverly programmed. But for things like presses and snatches this is a huge increase. The answer here was the introduction of the 10kg and 14kg kettlebells. For smaller ladies the 8kg can be too heavy for some of the movements, especially the armbar, pullover and halo, to be correctly learned. The answer to this came in the form of the 6kg kettlebell. This also allows trainees to avoid the dishonour of using the 4kg kettlebell, a use for which I have yet to find. Gentlemen, as with the ladies the 16kg can sometimes be too heavy to correctly execute some of the mobility movements well. Moving down to the 10-12kg can be useful though I have rarely had to keep a gentleman here for long. Many men struggle with the jump from pressing the 16kg to pressing the 20kg, a 25% increase. This is normally due to not enough time spent developing technique with the 16kg and working on mobility. This isn’t an issue of kettlebell package selection and more an issue of an overeager trainee trying to advance too fast! An athletic trainee might quickly grow beyond a 16/24kg kettlebell for exercises such as the two-handed swing, but this is where the deviousness of the kettlebell reveals itself. This can go on forever, your strength/power kettlebell becomes your cardio kettlebell, which becomes your mobility kettlebell. Until somewhere down the road you are using the 24kg for your armbars and bottom up presses during your warm up. With these combination of kettlebells, with quality coaching and progression, you will always have something you can work with! In the final part of our series we’re going to talk about the ergonomics (size and dimensions) of the various kettlebell brands available and what to watch out for when buy your kettlebell!